Throughout the outlying keys in the lower Keys, you will find a variety of small isle-like land formations that are outlined by rows of the interesting mangrove tree. The Dry Tortugas have a handful of isles and islands that house these trees. Mangroves are totally native to Florida and found in coastal areas, with their roots in the salt water. They are able to extract fresh water from the salt water, some by secreting salt through their leaves and others by blocking the absorption of salt through their roots. The mangrove ecosystem is highly important to the general environment in coastal areas of Florida. They trees trap and cycle a variety of organic materials, chemical elements and other important nutrients. They have many long roots that stick out of the water, creating important surface area to trap the nutrients. These roots are also essential to the marine animals that feed in these trees or even make their home around here. These trees are a key part of the marine ecosystem in coastal Florida areas like the islands near Key West. They provide a habitat for various fish, crustaceans, and shellfish. These include snook, snapper, tarpon, red drum, oyster and shrimp. The branches of the trees also house coastal birds including pelicans and roseate spoonbills. The mangroves in Florida are tropical plants and thus are very sensitive to any extremes in weather. Their growth and distribution are also sensitive to changes in salinity, water temperature, tides, and soil. 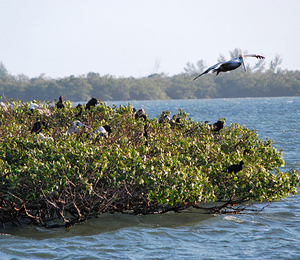 Mangroves are important for the coast in that they prevent erosion and surge storms that are caused during hurricanes. On top of their usefulness in Florida's ecology, mangroves are some of the most pleasant and interesting trees to look at. Their root structure is simply astounding and the way they jut out of the water is quite curious.